It’s really quite incredible to watch as new applications for 3D printing come about. Pretty much every field imaginable has at least some use for this incredible technology, which only has begun to get noticed. Last week, we saw how one man, named Doug McCune, 3D printed the USGS Earthquake Data from last month’s quake in the Napa Valley area of California. It turns out that this is not the only 3D print of a natural disaster currently available. Francis Reddy, a science writer who’s on contract with NASA’s Goddard Space Flight Center, and author of several books related to astronomy and space science, has 3D printed a hurricane. Every year, in the United States alone, there are tens of millions of people at risk from hurricanes, mainly in the Atlantic basin, which includes the entire eastern seaboard, as well as the coast of the Gulf of Mexico. This year, however, likely due to a mild El Nino event, has been a bit unusual. The main threat to the United States has been within the Pacific Basin, particularly Hawaii. On August 7th, Hurricane Iselle became the strongest tropical cyclone in recorded history to make landfall on the Big Island of Hawaii. When all was said and done, the total damage to the State of Hawaii was estimated at around $80 million, mostly attributed to crop losses. On the heels of Iselle, was another Hurricane name Julio, which many computer models predicted could also affect the state. In the end, the hurricane passed well north of Hawaii, sparing the island state from a one-two punch. 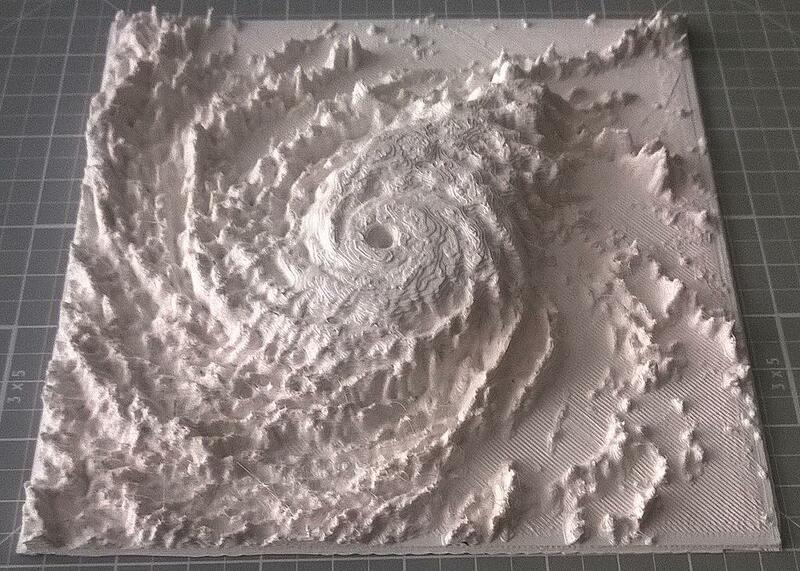 It was this hurricane, which Reddy decided to 3D print. The two images he used were taken at a near perfect angle by the GOES 15 satellite. One image was the actual visible satellite photo, while the other was the infrared enhanced satellite used to show the temperatures of the cloud tops, and thus the heights of the clouds. Colder and higher cloud tops usually represent the stronger cells within the storm. The images were taken at 2100 UTC on August 7, when Julio was a Category 2 storm, centered around 17.1 degrees north latitude, and 137.7 degrees west longitude. The final print came out quite well, showing the varying heights of clouds in relation to one another, based on the brightness of the pixels within the infrared image. The model was 3D printed by Reddy on a Da Vinci 1.0, using stock ABS. “The first two attempts suffered warping issues so bad they could not be completed. I began using ABS juice and have not had a problem with warped prints since,” he explained. Reddy’s model has been provided to NASA, who has responded by allowing the public to download the .stl file free of charge, enabling anyone with a 3D printer to fabricate their own version of Hurricane Julio. The default size of the model, when printed, is 5.3 inches per side, representing an actual distance of 787 miles. The model, in .stl format, can be download here. Reddy wanted us to stress that this 3D print is more of an art form than a scientific model. He is not a scientist and is only a beginner when it comes to 3D printing. Despite this, the project is certainly an interesting one, which hopefully Reddy as well as others can continue to expand upon. Let’s hear your thoughts on Reddy’s utilization of 3D printing to better depict a powerful hurricane in the third dimension. Discuss in the 3D printed hurricane forum thread on 3DPB.com.